Audio information point for the public space, interactive & human powered. The Audionetic Spin offers an experience. 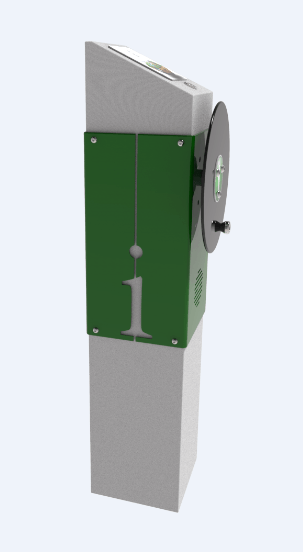 An Audionetic Spin is an audio information point, specially developed for public spaces. The Audionetic Spin can be used virtually everywhere. The energy supply which is needed for playing the audio clip is generated by the user himself. Simply by turning the disk. Therefore: absolutely durable and also ready for use in the midst of nature. Connection to public facilities is not necessary, and even batteries are superfluous. The Audioneitc Spin offers a potion of a QR code, with an text alternative for people with hearing disorders. Theme trails can be a new attraction to your park or city. Imagine a trail about a certain subject with at each 500 meters an Audionetic Spin specially designed for your promenade or park, for example a history trail, telling the story of your city. Or a Classical music trail.